Labor Day weekend is by far the busiest and most exciting weekend of the year in the Straits of Mackinac area. You will want to make your reservations for your campsite or cabin as early as possible. Most establishments only accept reservations for the whole weekend. Some hotels and campsites are filled for Labor Day before they open for the year just from their established return customers. Mackinaw Mill Creek Camping, because of its large size, is usually the last place to fill and accepts reservations usually right up to a few weeks before Labor Day. When regular campsites are full there is the option for sites with no table, no electric and rustic toilets (rally style camping). Of course, you have use of the all of the campground's modern facilities. You may just have to walk a ways further than the folks who got their reservations in early! Busses will pick you up at the campground and take you into town so you won't have to worry about parking. The busses start at the crack of dawn and stop running an hour or two before noon. Certificates are handed out to walkers upon completion of the walk that have numbers on the back that may match with numbers on shop windows in Mackinaw City. If they match - go on inside and claim your prize! Why do so many people want to be in Mackinaw City on Labor Day Weekend? 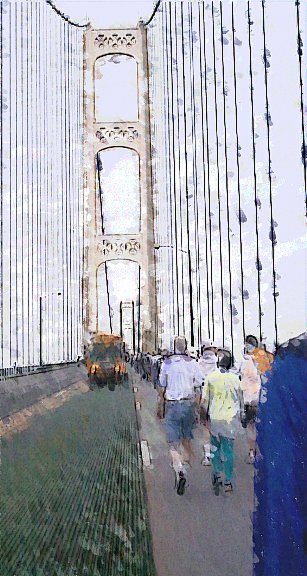 It is the only day of the year that you are allowed to walk across the Mackinac Bridge. Once you have experienced its grandeur in person, gazed upon the azure blue Straits of Mackinac, gasped at the incredible height of this beautiful suspension bridge - you too will be hooked! Make your reservation request now.